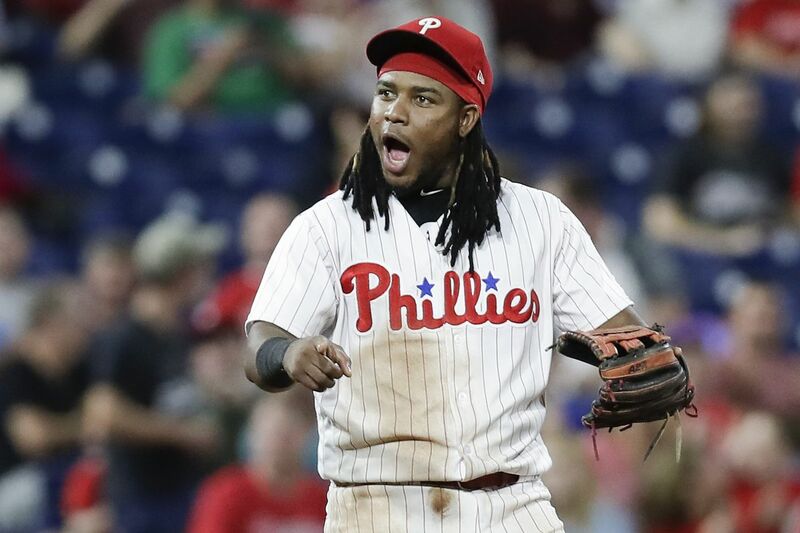 Maikel Franco has started only one of the Phillies' last seven games because of pain in his right wrist. NEW YORK — Maikel Franco can rest easy. There isn't anything seriously wrong with his wrist. Franco, who hasn't played since last Sunday and has started one of the Phillies' last seven games, rejoined the team on Friday after seeing a wrist specialist in Philadelphia. An MRI revealed "no concerns," according to manager Gabe Kapler, and the third baseman was diagnosed with a bone bruise and cleared to take batting practice. "It made me more relaxed right now because, even though I feel a little bit of pain in my hand, I know it's nothing crazy," Franco said before the Phillies opened a three-game series against the New York Mets at Citi Field. "Right now, it's not the same. It's much better." Franco jammed his right wrist on a swing two weeks ago. He tried playing through the pain but went hitless in 13 at-bats since suffering the injury. Earlier this week, Franco described the pain as a "6 or 7" on a 1-to-10 scale. He characterized it as a "5 or 4" after hitting soft-toss in the indoor batting cage Friday. It was not yet clear whether Franco will return to the lineup this weekend against the Mets. One offshoot of moving ace Aaron Nola up in the rotation by one day: Extra rest for struggling righthander Zach Eflin. When Eflin faces the Mets Saturday night, he will be pitching on six days' rest. He has a 6.20 ERA in his last four starts, including last Saturday night when he allowed four runs (three earned) on seven hits in five innings of a 7-1 loss to the Chicago Cubs at Citizens Bank Park. "I would bet on the physical benefit of having one additional day of rest," Kapler said. "It's been pretty well-studied." Eflin has made 20 starts and worked 111 innings, both career highs at the major-league level. Rookie outfielder Roman Quinn was out of the lineup after fouling a ball off his foot earlier in the week in Miami. With Quinn sidelined and the Phillies facing Mets lefty Steven Matz, Aaron Altherr began the game in center field, his first start since getting recalled from triple-A when rosters expanded last weekend. … The Phillies recalled catcher Andrew Knapp from triple-A, giving them 35 active players. … The Mets honored infielder Asdrubal Cabrera with a pregame salute on the scoreboard. Cabrera, who batted .279 with 55 homers for the Mets over the last three seasons, was traded to the Phillies on July 27. … Lakewood third baseman Jake Scheiner and lefty Zach Warren were named Phillies' minor-league hitter and pitcher of the month for August. Rookie-level shortstop Luis Garcia was named defender of the month.